Chin implants (also known as chin augmentation, chin surgery or mentoplasty) is a cosmetic procedure that reshapes the chin by placing an implant in the chin. Chin implants come in many shapes and sizes and are made from silicon rubber or medpor, a type of biocompatible plastic. Chin implant surgery is popular with both men and women and can be beneficial in balancing out a larger nose. A chin implant offers a permanent solution for people who want more shape in their jawline to balance out a ‘weak’ or ‘small’ chin. Why do people get chin implant surgery? The cosmetic procedure can help harmonize and balance your facial features. Chin implant surgery is a relatively easy procedure and can create dramatic improvement in the silhouette and profile of a person. All of your facial features should all be proportionate to each other. If your lower jaw is set back or undersized, it can portray a weaker jaw and project a less masculine appearance. A specialist Cosmetic Surgeon can use a chin implant to create a jaw that is more aesthetically pleasing. In some cases, chin implant surgery is performed with other facial procedures including a facelift and neck lift. Would you be suitable for chin implants? A good candidate for chin implant surgery needs to be in good health. It is also important they are not a smoker. Smoking can increase the risk of scarring and decrease the wound healing ability of the body. Before you have chin implant surgery, your Cosmetic Surgeon will take X-rays of your chin and face. They will also discuss your expectations of the surgery; your expectations must be realistic. Chin implant surgery is performed under local or general anaesthesia. Your Cosmetic Surgeon has two surgical techniques to consider using. They can either insert the implant orally by making a small incision on the inside of your mouth at the intersection of the lower lip and gum. Or they can insert the chin implant externally under the chin along its natural crease line. After the chin implant has been inserted and positioned, it will be secured onto the soft tissues of your chin with sutures or screws. The best technique to be used will be determined by your Cosmetic Doctor during your consultation. The risks and complications of chin implant surgery are rare but may involve shifting or infection of the implant, scarring of the chin and numbness on the chin. Most patients return to work after 7-10 days. 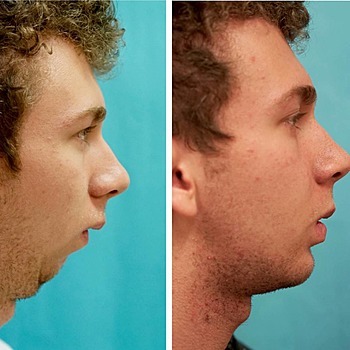 It is important to note that the final results of chin augmentation surgery are usually seen 3 to 4 months following the surgery, with some patients reporting the best results are seen 12 months after surgery. Are there are risks or complications with chin implant surgery? Any surgical operation brings complications of anaesthesia; your anaesthetist will outline the possible complications of having an anaesthetic. 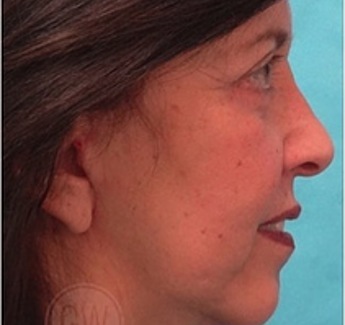 The risks and complications of chin implant surgery will vary from person to person. It is important to choose a highly trained and experienced Cosmetic Surgeon. Most people who choose to have chin implants think their chin looks too small. To provide facial balance and proportion, your Cosmetic Doctor may also suggest a rhinoplasty procedure. Because chin implant surgery can require an incision inside your mouth, it is important to tell your Cosmetic Surgeon if you smoke, or if you have any gum or dental or problems. If synthetic implants such as silicone are used, the results of chin implant surgery are permanent. However, removing the implant can reverse this. Chin implant surgery changes the size and shape of the chin, resulting in an enhanced appearance of the chin and jawline. The insertion of a chin implant can take from 30 minutes to an hour. 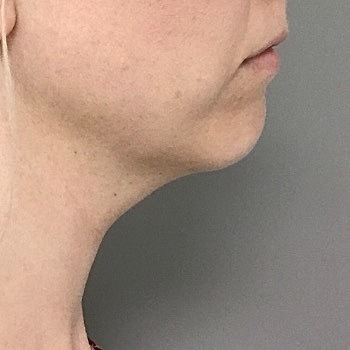 A chin implant will not reduce the vertical chin height. However, if they are placed lower on the mandible (jawbone), they can increase the chin height (the distance from the lower lip border to the bottom of the chin). Are there any alternatives to chin implant surgery? There are surgical and non-surgical alternatives to chin implant including genioplasty (chin augmentation) and dermal fillers. 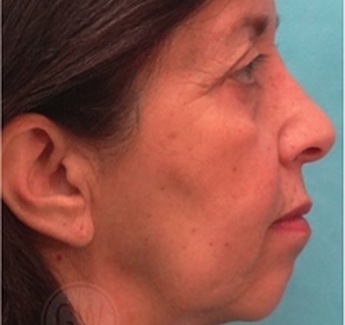 Genioplasty surgically advances the bone of the chin point forward. In some cases, bone grafts are added. If your whole jaw is set back with an overbite, you may also need to have the jaw advanced and the bite corrected. In this case, the whole jaw is the problem, not just the chin. This will require expert assessment by your Cosmetic Surgeon and an Orthodontist. Non-surgically, chin augmentation can be achieved with injectable dermal fillers. 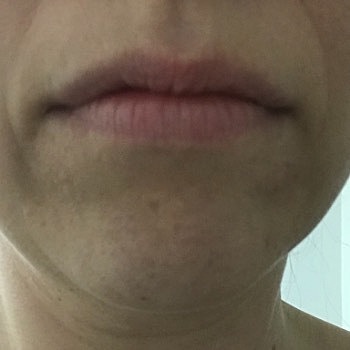 What is recovery like after having chin implants? After the chin implant surgery, your chin will be supported with a dressing, chin guard or tape to secure the implant in place. You will need to wear this for 2 to 3 days. The sutures used to close the incisions will usually dissolve on their own after about three days. Your Cosmetic Surgeon may also remove it after 3 days, together with the removal of the chin support. After your chin implant surgery, you will experience some swelling and discomfort. You may even feel like your chin is being stretched. To prevent infection and relieve any pain, you will be given antibiotics and pain relieving medication. Most patients return to work after 7-10 days. Refrain from performing strenuous activities for about 3 weeks. While chin implant surgery is a relatively minor cosmetic procedure, it is important to consult with several Cosmetic Surgeons. Having realistic expectations about chin implant surgery is vital. While chin implant surgery is usually effective and safe, there are risks and complications associated with it. You can find the best Australian Chin Implant Surgeons here. So you can make an informed decision, your elected Cosmetic Surgeon will discuss the possible risks associated with chin implant surgery. These include infection, and nerve injury. Although the majority of patients do not experience these complications, it's important to understand how they can be managed in the event that they occur. I first met Dr Watts when I transferred from a children hospital to a adult hospital system at the age of 18. We discussed the issues surrounding my health, the cause and problem that had arisen with my juvenile arthritis as I grew. During this time the urgency for surgery to be done on my jaw was clear, firstly Dr Watts liaised with Dr Gillett and my orthodontist Dr Wholley about braces and wisdom teeth removal. As time moved forward I had x-rays and molds to help map out how my teeth were going and how the surgery would be conducted. Dates and times were the set for June of 2016 and appointments became regular. The surgery completed was a lower jaw extension with a chin point extension, as well as the top-mid section of my upper jaw lowered. The procedure went very well, I awoke with minimal pain. There was a lot of swelling due to the process completed on my jaw. Recovery was about 5 days in hospital, a liquid diet for 6 weeks. A splint was inserted into the upper area of my mouth to help hold the top part together. The surgery was completed and was planned using a 3-dimensional technological system, which mapped out my face and help the surgeon out. The splint was removed after 6 weeks, which allowed me to be able to eat soft mushy food. I felt that the surgery was done in a very professional manner and exceeds my expectations. Once the swelling disappeared I was amazed at the end result. The work done by Dr Watts and his team with Dr Gillett and orthodontist Dr Wholley and his team was exceptional. The surgery was well planned and they were very professional and friendly through-out the entire process. I would like to say a big thank you to Dr Watts, Dr Gillett and Dr Wholley for the work that they have produced on my jaw. Also for the opportunity to have a healthy life. This has also got my life back on track and has helped with being able to have the confidence to go out and be part of the larger community.